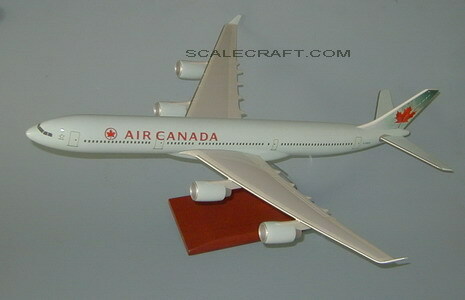 The A340-200 and 300 are the initial variants of the successful quad engined A340 family of long haul widebodies. The A340 and closely related A330 were launched in June 1987, with the A340's first flight occurring on October 25 1991 (an A340-300). The A340 entered service with Lufthansa and Air France in March 1993, following JAA certification the previous December. Resin. Scale: 1/100. Wingspan 23 3/4 inches, Length 24 3/4 inches.